An image slider is included with the Tweak Me v2 theme. To activate it, visit Appearance > Theme Settings, click the "Layouts" tab, then click the Image Slider link. Once on that page, you can choose the slider position. Choose your settings and save. After activating the slider, click the Static Homepage link. 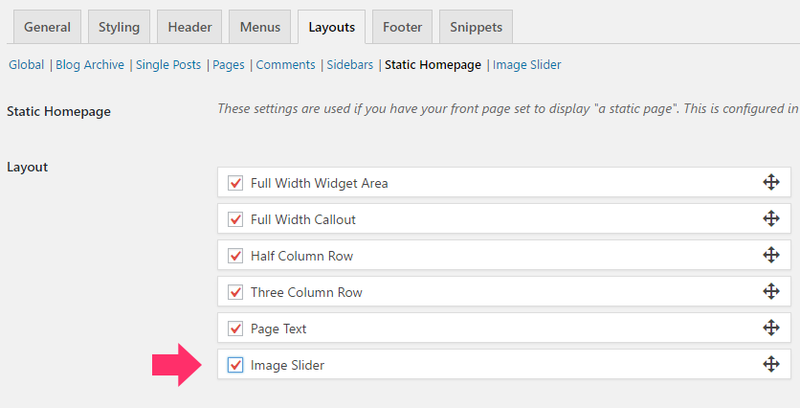 Inside the Layout section, find the "Image Slider" box and check it on. You can then drag and drop it where you want and save. After saving your settings, you should see a new tab in the admin panel on the left called Image Slider. Hover over that and choose Add New. Here's where you add a new slide. Enter a title for the slide (only seen in the admin area -- for your reference). Upload a slider image (click "Add Slider Image"). Enter a URL for the slide to link to when clicked on.